This asana is very simple and good start for beginners. Vajra means thunderbolt in Sanskrit and asana means posture. This asana helps in improving digestive system and releases back pain. Sit comfortably on the yoga mat with legs stretched straight and spine straight. Bend your knees and sit on your buttocks. Keep the hands on your legs. Interlock the toes and keep your back, neck straight. Hold this position as long as you can. Take a deep breathe. Get back to normal position and relax your legs. Breathe normally. Strengthens the muscles of legs and back. Helps people suffering from constipation and stomach disorders. It also improves digestive system. Helps people suffering from knee pains. Also tones muscles of hips, thighs and calf muscles. One can also do pranayama sitting in this position. 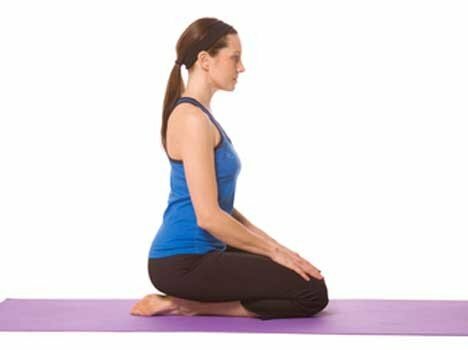 Some physicians claim that vajrasana can cause stiffness in knee, ankle and legs. May cause slip disc in extreme cases.